CAUTION: Bonds Skin Instantly: Games Workshop Mystery Release Revealed: Dreadfleet! Games Workshop Mystery Release Revealed: Dreadfleet! A few months ago, I revealed that Games Workshop is issuing a mystery box for sometime in September/October. At that time, details were very sketchy, and instead of posting rumours, because there really was nothing to post, and I tend not to post rumours, I decided to do a little speculation. Personally, I was hoping and thought it would be a new Special Edition Bloodbowl, for a variety of reasons. Instead of a new Special Edition Blood Bowl, Games Workshop presents Dreadfleet! An undead pirate fleet game, written by Phil Kelly, and based in the Old World of the Warhammer Fantasy setting. 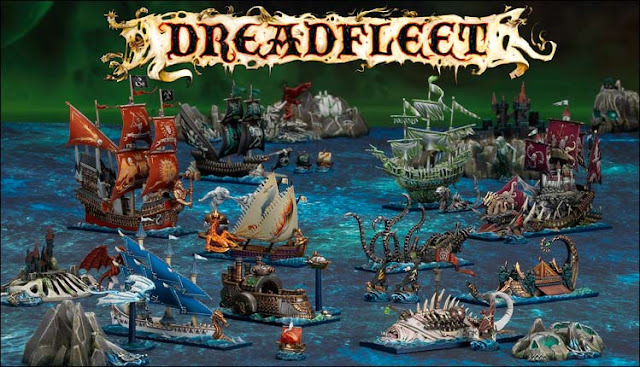 Games Workshop's Dreadfleet, a game of fantasy naval battle. This game will be available for only a limited time, much like Space Hulk in 2009. So, if this strikes a chord in you and has piqued your interest, make sure you pre-order today and don't miss out. Be sure to check out the Games Workshop blog page and pre-order page (links can be found at the end of this article) to see a whole bunch of pictures, including 360 degree pictures, as well as a video, and close ups of the models and sprues. Now. What do I think of this? Naturally I am disappointed that my speculation was erroneous, though it was still fun and I still think it should have been Blood Bowl for all the same reasons. Note that in that article I didn't even mention Man O'War as a possibility because I thought the range and support required would be too vast to consider such a game. However, I have always loved Games Workshop's Man O'War game, and though it might just be riding on the coat tails of Spartan Games' Uncharted Seas, which many are speculating inspired this release, the look of this new game really does remind me a lot of Man O'War. Or more correctly, Man O'War Light, because there are no expansive fleets available for every race, where Dreadfleet has a very small selection of ships available, with only 10 large ships from different races, and not all of the races represented. Having said that, if you still play Man O'War and are looking to expand your fleets or get sea monster and dragon tokens, islands, etc, this might just be the ticket... that is if the scale is appropriate. At first glance, the large ships might just fit in well with Man O'War fleets, but the smaller support ships appear vastly smaller, and more like tokens than actual vessels. Ultimately, this was meant to be a one off self contained game, and that niche target group is obviously accounted for by the limited quantity being released. Will this do as well as Space Hulk? Or will it become just a footnote in the history of Games Workshop games? Will these models be suitable for Man O'War, or Uncharted Seas? Only time will tell. But I can tell you this, if I can scrounge up the money to buy it, I'm getting myself a copy pronto. Speculation: Games Workshop September Mystery Release? Copyright Notice: Original image used for this article owned and copyright by GamesWorkshop PLC, and used without permission, for the express purposes of distributing hobby news, freely promoting the hobby, and the free exchange of hobby related ideas. No challenge is intended. Project Orks: Part 3 - 'Ere We Go!